Keeping the cabinetry low added to the feeling of space in this kitchen by Kira Gray. Tiling the back wall added texture to the design. 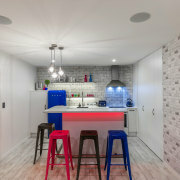 Designer Kira Gray created these two quite different stand-out kitchens. One classic and chic, the other retro and cool, both designs boast great features and hard-working appliances. 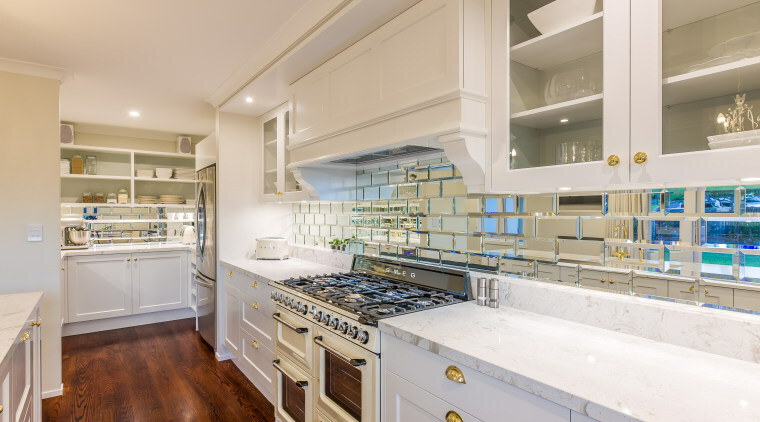 Replacing a small, dark, detached kitchen, the first now-roomy and light kitchen design meets the clients' wish for a traditional, French-inspired design with modern accents. They wanted an elegant yet cosy kitchen. "Walls were removed and relocated to create one large space," says Gray. 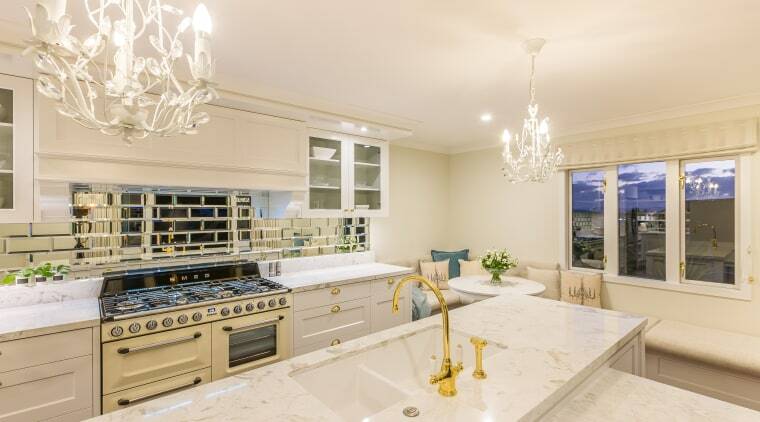 Sleek features and a Smeg Victoria cooker set off this traditional-meets-glam kitchen by Kira Gray of Fyfe Kitchens. The balanced cabinetry on the kitchen's back wall incorporates the cooking area, with colonial detailing framing the Smeg Victoria cooker, while a Smeg powerpack clears the air. Housing the sink and low homework table, the island is anchored by chamfered posts and skirtings. 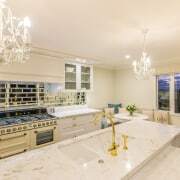 "Combining crystal chandeliers, modern crystal stools, brass tapware and ergonomic handles, the kitchen feel glamorous and warm. 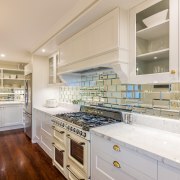 Linked by mirrored brick tiled splashbacks, the scullery is just as appealing as the kitchen. The second kitchen is pop-retro a space for two daughters to be self-sufficient through their university years. Requests included a chic kitchen with an industrial, textural edge. A French-look round table and booth seating echo the kitchens surfaces and Black White Resene colourway in this design by Kira Gray. Mirror tiles feature in the kitchen and scullery. The kitchen's white cabinets and benchtops set the base tone for the colourful accessories the shelves and canopy are in an aged metallic to match the cabinet handles. 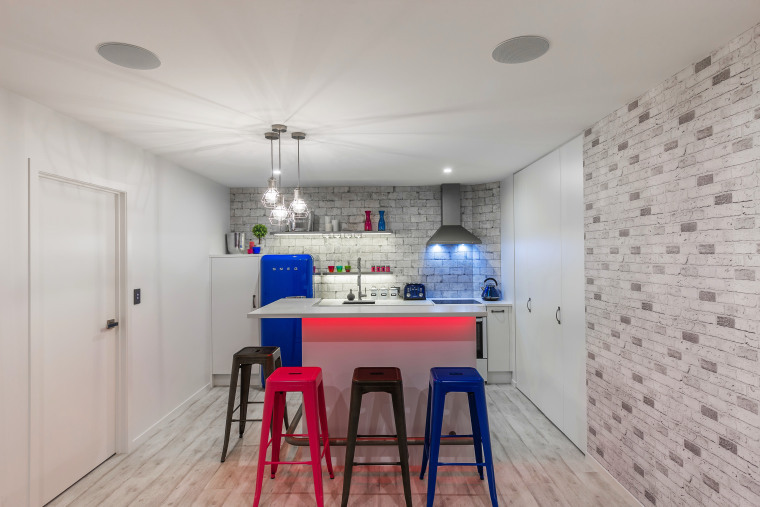 Industrial-look pendants and Smeg's colourful retro fridge were specified, while LED-lit shelves give the design even more punch.